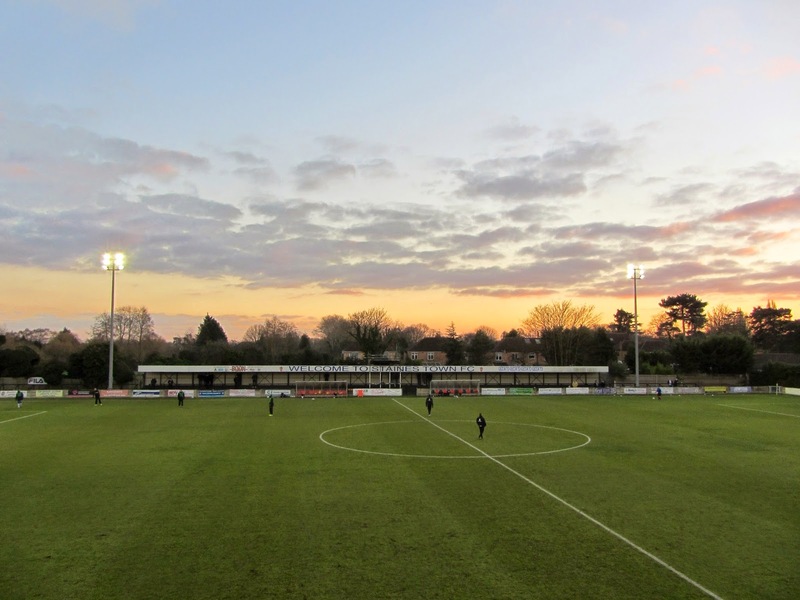 My twenty-fifth stadium of 2014 was on Sunday 28th December at Wheatsheaf Park in Staines-upon-Thames, Surrey. 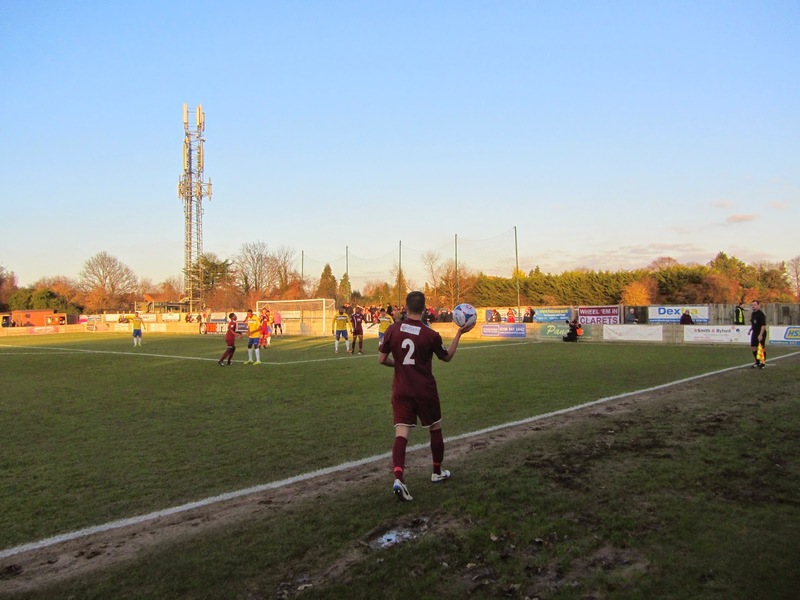 The match was Staines Town vs. Chelmsford City in Conference South. 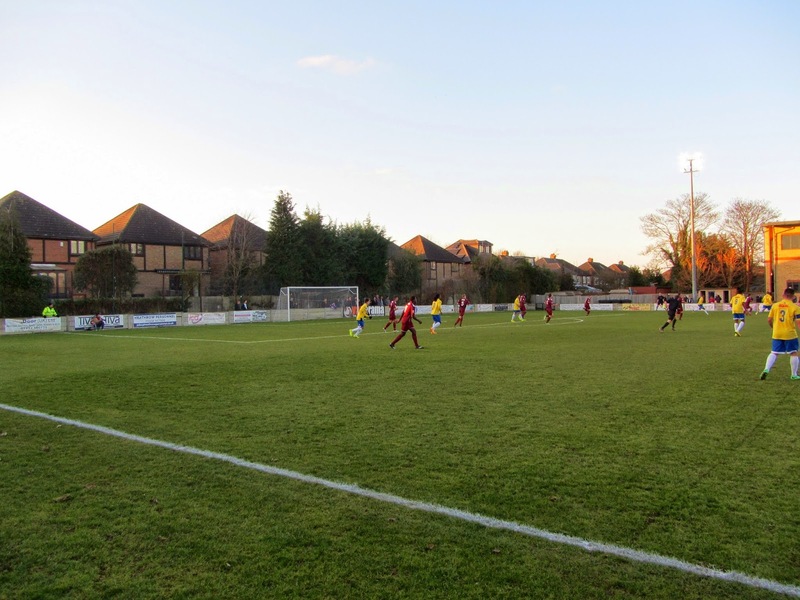 Wheatsheaf Park is located in a built-up residential area in the south of the town just over a mile from Staines railway station. The club bought the venue in 1951 and after a few years away during redevelopment returned in 2003. The main stand is part of the £6.5m redevelopment to the site which took place during the early 2000s. This conference and leisure facility includes the Thames Club health centre which dominates the exterior of the ground. Facing the pitch there is a 300 seat structure which is raised above the walkway below to give good views of the game. Adjacent to this is a small club shop. On the opposite side there is a fairly long covered metal terrace which takes up around half of the southern side of the venue. In front of this sits the two dugouts. The rest of Wheatsheaf Park is uncovered standing with fairly narrow sections behind the two goals. 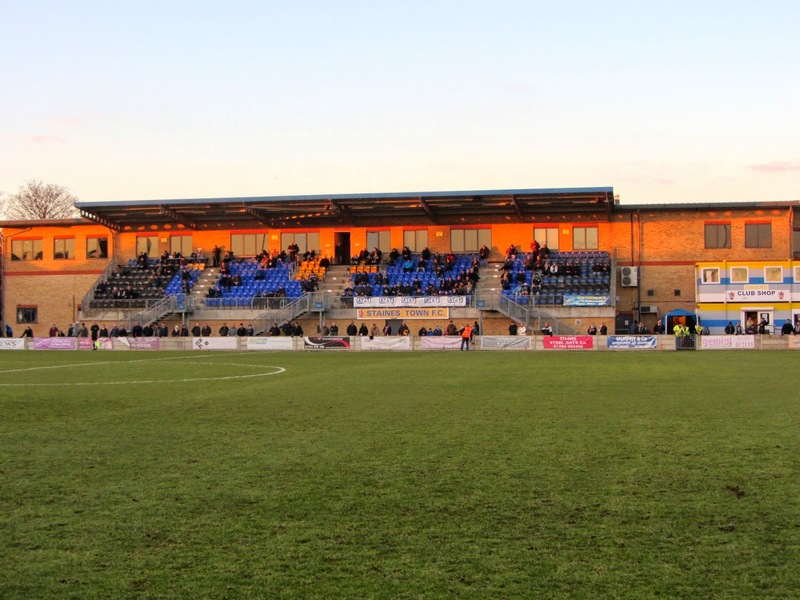 Staines went into the game rooted to the foot of the table but started brightly and in the 21st minute took the lead when Elliot Charles laid the ball off to Ashley Lodge who drove the ball past the Chelmsford keeper. In the 36th minute Charles managed to grab a goal himself when he poked home from close range to make it 2-0 to Staines. Just as the hosts were looking comfortable they let Chelmsford back into the game when Jerel Ifil gave the ball away to Michael Cheek on the edge of the box allowing Cheek to knock the ball into the net to give the visitors hope for the second half. Buoyed by this the visitors tore Staines apart in the second period notching up four goals in a 25 minute spell. The first came in the 53rd minute when Rohdell Gordon crossed for Cheek to volley past the Staines keeper. Jaanai Gordon made it 3-2 in the 66th minute after a strong run through the home defence and in the 71st minute Cheek completed his hattrick from a few yards out after the goalie had parried a Leon Redwood shot. A few minutes later Cheek added his fourth and Chelmsford's fifth when a deflected shot looped into the back of the net. Calum Willock managed to get a goal back in injury time to make the score a little more respectable but it was a disastrous second half for Staines who parted company with manager Marcus Gayle after the match.